A two Judge Bench of the Supreme Court today in Seshachalam and Others vs. Chairman Bar Council of TN [Civil Appeals 11454-11459/2014] upheld the Madras High Court Judgment which held that “there is reasonable classification between the advocates who had set up practice after demitting their office from the Central/State Government/Organization and advocates who have set up practice straight from the law college the retired officials who joined legal profession constitute a separate class and the disentitlement of the benefit of lump sum welfare fund to this group of advocates cannot be said to be unreasonable. The Court was examining the question whether proviso to Section 16 Explanation II (5) of Tamil Nadu Advocates' Welfare Fund Act, 1987 denying the payment of two lakh rupees to the kin of advocates receiving pension or gratuity or other terminal benefits would be violative of Article 14 of the Constitution of India and whether distinguishing this class of advocates from other law graduates enrolling in the Bar straight after their law degree did not have any rational basis. The Court also examined the vires of Section 1(3) of the Bihar State Advocates' Welfare Fund Act 1983 which excludes the persons who have retired from service and are in receipt of retiral benefits from their employers from the purview of the Bihar State Advocates' Welfare Fund Act. “in the light of the well-settled principles of interpretation of Article 14, it is to be seen whether there is intelligible differentiabetween the classification of advocates who had set up practice straight after enrolment and other advocates who start their practice after demitting the office and are in receipt of pension and other benefits and whether the differentia has a nexus with the object of the Act. The profession of law is a noble calling. The legal fraternity toils day and night to be successful in the profession. Although it is true that slowly working one's way up is the norm in any profession, including law, but initially young advocates have to remain in the queue for a prolonged period of time and struggle through greater hardships. Despite being extremely talented, a number of young lawyers hardly get proper opportunity or exposure in their profession. New entrants to the profession in the initial stages of the profession suffer with the meagre stipend which young lawyers may receive during their initial years, coupled with the absence of a legislation concerning this, they struggle to manage their food, lodging, transportation and other needs. Despite their valiant efforts, they are unable to march ahead in their profession. It is only after years of hard work and slogging that some of the fortunate lawyers are able to make a name for themselves and achieve success in the profession. For the majority of the legal fraternity, everyday is a challenge. Despite the difficult times, the lawyer who sets up practice straight after enrolment, struggles to settle down himself in the profession. Some of the lawyers remain struggling throughout their lives yet choose to remain in the profession. It is something like "ridinga bicycle uphill with the wind against one". Contrariwise, the retired employees like the appellants who are law graduates did not withstand the difficult times in the profession. They opted for some other lucrative job during their prime time of their life and lived a secured life. Others found some job and positioned themselves in a comfortable place of employment, chose to join evening college or attended part time classes and obtained law degree and having retired with comfortable retiral benefits, further securing their future, they enrol themselves as an advocate to practice. The retired employees have the substantial retiral benefits, gratuity apart from receiving pension. The availability of lump sum retiral benefits with pension makes a retired employee better placed than their counter part lawyers who struggle through difficult times. The various welfare fund schemes are in actuality intended for the benefit of those who are in the greatest need of them. The lawyers, straight after their enrolment, who join the legal profession with high hopes and expectations and dedicate their whole lives to the professions are the real deservers. 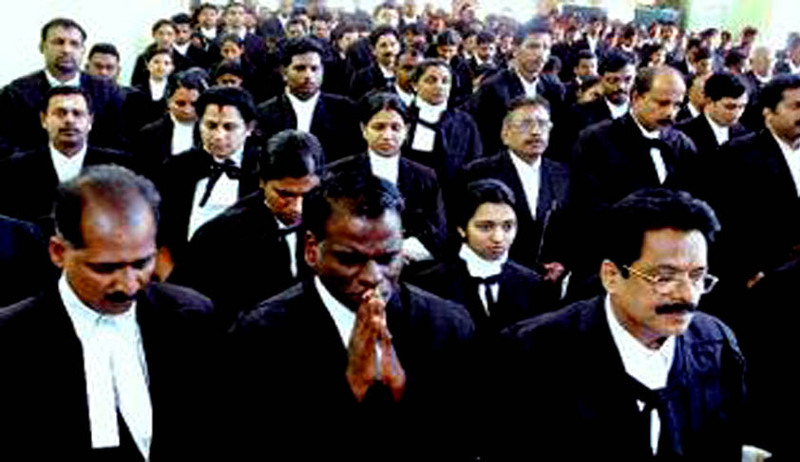 Lawyers who enrol themselves after their retirement from government services and continue to receive pension and other terminal benefits, who basically join this field in search of greener pastures in the evening of their lives cannot and should not be equated with those who have devoted their whole lives to the profession. For these retired persons, some amount of financial stability is ensured in view of the pension and terminal benefits and making them eligible for lump sum welfare fund under the Act would actually amount to double benefits. Therefore, in our considered view, the classification of lawyers into these two categories is a reasonable classification having a nexus with the object of the Act. Furthermore, it is also to be noted that in view of their being placed differently than the class of lawyers who chose this profession as the sole means of their livelihood, it can reasonably be discerned that the retired persons form a separate class. As noticed earlier, the object of the Act is to provide for the constitution of a Welfare Fund for the benefit of advocates on cessation of practice. As per Section 3 (2) (d)any grant made by the Government to the welfare fund is one of the source of the Advocates' Welfare Fund. The retired employees are already in receipt of pension from the Government or other employer and to make them get another retiral benefit from the Advocates' Welfare Fund would amount to double benefit and they are rightly excluded from the benefit of the lump sum amount of welfare fund. Section 28 of the Central legislation-Advocates' Welfare Fund Act 2001 provides that no senior advocate or a person in receipt of pension from the Central Government or State Government shall be entitled to ex-gratia grant under Sections 19, 21 and 24 of the said Act. Thus, the Central Act as well as the State Act does make a distinction amongst the advocates on the premise that a group of advocates receive certain financial assistance from the State Government or the Central Government or some other employer in the form of terminal benefits and pension etc. Corresponding Acts of various States namely Kerala Advocates Welfare Fund Act (Section 15), Orissa Advocates Welfare Fund Act (Section 15) and Rajasthan Advocates Welfare Fund Act (Section 16) contain similar provisions making differentiation between advocates who enrolled themselves as advocates after demitting their office and the other class of advocates who enrolled as advocates straight from the law college and set up the practice. We are unable to agree with the learned counsel that the distinction amongst the two class of advocates is unreasonable or irrational.
" Advocates Welfare Fund is enacted with the object of providing social security in the form of financial assistance to juniors and the welfare scheme for indigent or disabled advocates. As the appellants are already in receipt of pension from their employers, in our view, there is no arbitrariness in excluding them from the applicability of Bihar State Advocates' Welfare Fund Act’.